I was very much into soul music in the early seventies. I used to buy most of my records at a local record shop. But records were expensive and I could only afford to buy one or two 45’s every two weeks, and LP’s only on special occasions. But when i was thirteen I discovered a record shop in a neighbourhood where my girl friend lived, that sold cut outs for only a few euros. (We had guilders back then, but anyway.) I didn’t know what cut outs were back then, and all these records were new to me. In the local record shop I sort of knew what they had in store, but this was import, and most of the artists were unknown to me. I cannot remember the name of the store, but I remember exactly were it was and how it looked. I was always very excited when I hang around in that shop. As far as money allowed, I bought all the records with promising titles, names or sleeves. Among those buys were the two Watt Stax albums (with Richard Prior on it, who I found incredibly funny back then), and records by The Dramatics, The Isley Brothers, King Curtis, Swamp Dog and many more. I also bought some cassettes in that shop. Prefab tapes were never popular, not even then, but since it was the only way for me to get to hear certain music, I didn’t mind buying cassettes. I don’t remember what I paid for a cassette, but it was less than what the cut out LP’s cost. Unfortunately I didn’t keep all the tapes, and during the punk explosion I even sold some of my soul LP’s. I have bought many of these records back later, but not all of them. In the boxes with records from Alex Sas were two James Brown records, that I once bought at that store. That is what triggered these memories. 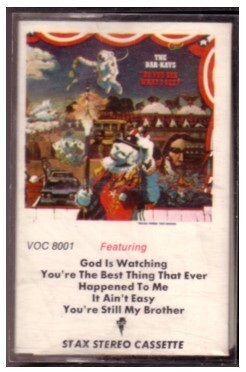 One of the cassettes that I bought there and still have, is by The Bar-Kays, Do you see what I see . Being used to more sophisticated soul, like from The Stylistics and The Tramps, this music by The Bar-Kays had a deep impact on me. It was dark and heavy, and I didn’t fully understand it. But I understood that it had a message and that the message was about being black. Here is a song of that tape, Do you see what I see? . A good reason to have bought cassettes is that they have no scratches. Every time I make a CD of one of my tapes, I wish I had bought more of them! Wow, what a trip! Didn’t know this song.